It’s every bride and groom’s biggest concern: Budget. Many couples get a sense of sticker shock when they find out how much weddings cost, and justifiably so. While the end result is a beautiful day and celebration that in some ways is priceless, there’s no getting around the fact that spending a certain sum on ‘one day’ can be uncomfortable. 1. The extras. You don’t always need that something ‘extra’. For example, gold leaf on your cake can be pricey; buying a roll of exquisite satin gold ribbon instead can save a significant amount of money. Letterpress invites are lovely; but not necessary. Flat printed invitations look beautiful and are elegant enough without the additional charges. 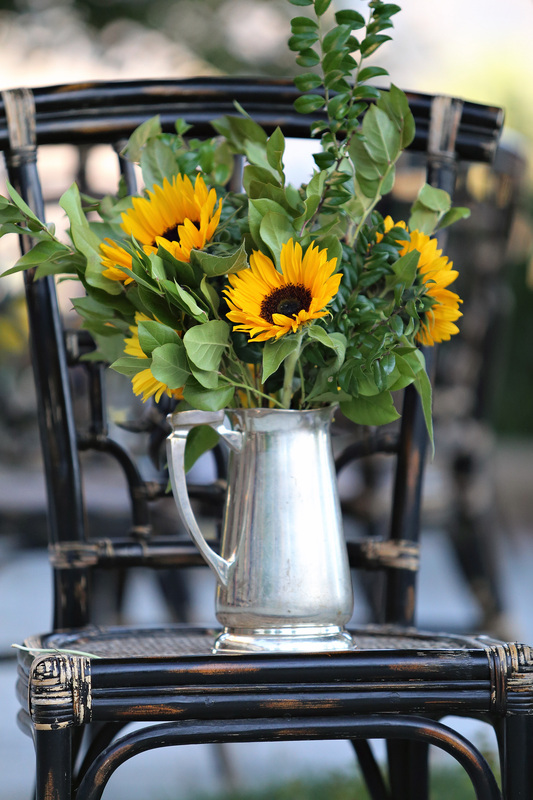 We created this sweet centerpiece with inexpensive greenery and sunflowers, using a pitcher that we sourced from the rental company for that evening’s event. Photo by Lorenzo Hodges. 2. Food! Food is one of your biggest costs, as is venue (particularly if the venue is lumped in with food, such as when hosting an event at a hotel). If working an out of the box space where you can provide your own food server, be careful about using a food truck or taco cart. 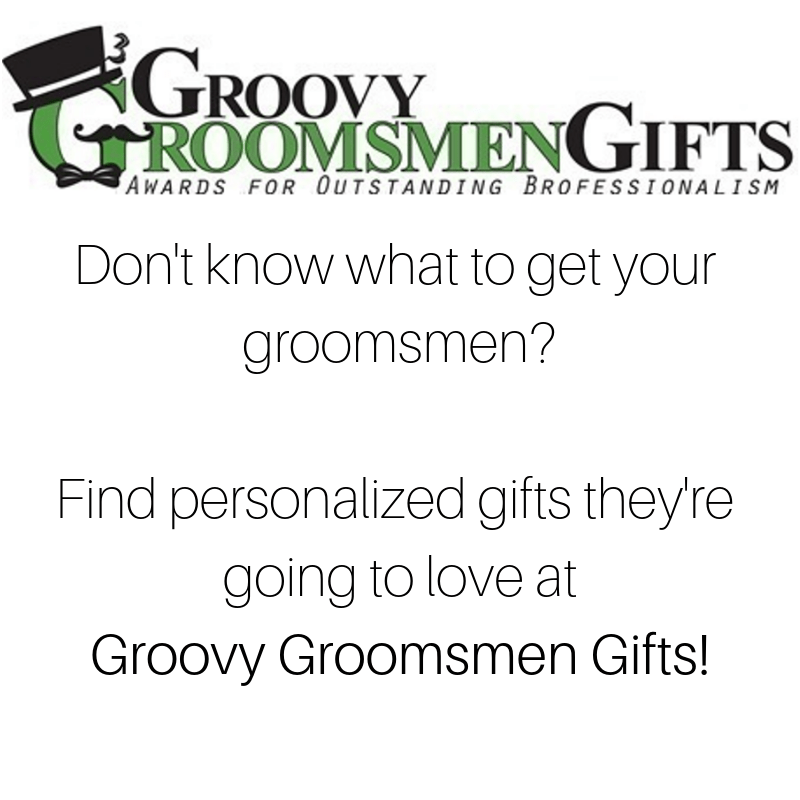 These are great options for saving money, but you need additional staff to properly serve at the bar and clean up at the end of the night. 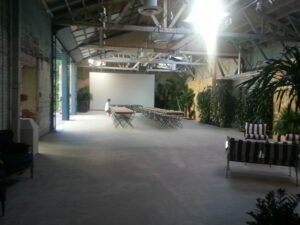 A space like the Millwick in downtown LA (http://marvimon.com/Millwick) already has some kitchen infrastructure, lighting, and dining tables and chairs, allowing for savings on outside rentals. 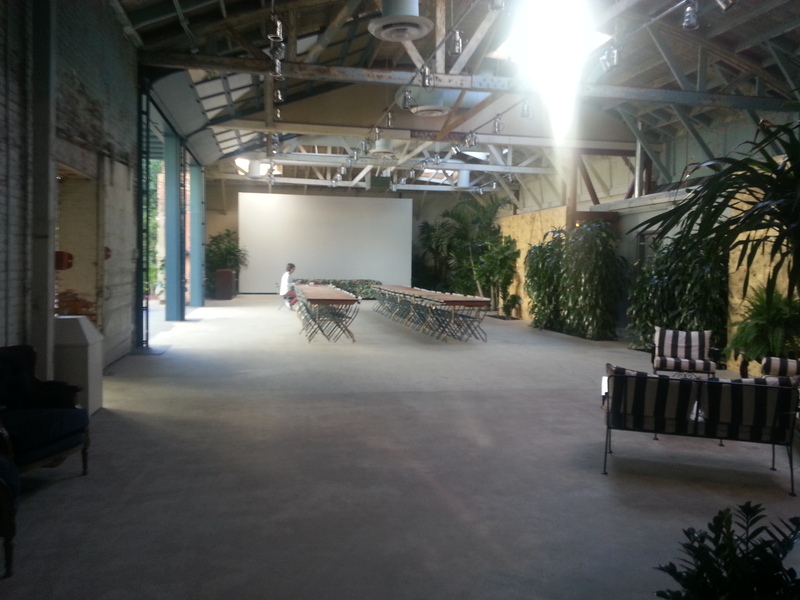 Food trucks are also doable at this space. 3. Decor. Beware DIY tips online – there are some awesome tutorials out there, but when you see a photo of a stunning decor idea that is labeled cost effective or DIY, ask yourself, ‘how much would the labor cost?’ Hanging lights, large floral pieces, etc – all those projects cost in labor, and anything that requires going up a ladder means serious liability risks. So be sure to factor the labor in to any supposedly ‘easy’, ‘inexpensive’ DIY project. A professional event planner’s goal should always be to create a gorgeous and lovely day without sinking a client’s budget. It takes innovation, experience, and familiarity with cost controlling procedures. Typically working with an event planner can save you money and keep you at budget. (Some statistics say the average couple otherwise goes over budget by 30%.) There are also all sorts of wacky fees (“administrative charge,” “AV liaison fee,” etc) that can rear their ugly heads when clients least expect it, whereas event planners frequently see them coming long before they are an issue. I often recommend to a couple on a tight budget to hire a planner just to do a budget consultation. That way, they have a good idea of all those scary unknowns, and have the most accurate information on realistic pricing. This consultation also gives them solid strategies for progressing along their planning process with extensive wisdom based on a pro’s experience. Then the planner can become involved again a couple months out and serve as day of coordinator to bookend the entire process. Once your goals for each wedding expense are locked in, you can proceed with authority and way less stress. For more about budgets, check out our past blog posts here and here. Happy planning!